New digital technologies and mediums are informing, challenging and reinventing our notions of narrative structures and storytelling. Non-linear, virtual, artificial, interactive, and cyber culture have become common terms and concepts when describing the emerging integration of science, art, and sociology. The Digital Narrative explores ideas of how storytelling and communication is influencing and influenced by new and emerging technologies. 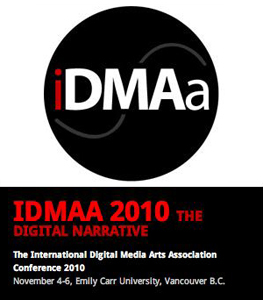 Leading academics, professionals and artists will gather at Emily Carr University of Art and Design for the International Digital Media and Arts Association’s 8th annual conference to explore the world of digital technologies with a focus on the subject of The Digital Narrative. The conference will include workshops, keynote speakers, “extreme close-up” guest panels, paper presentations, networking, discussions, and social events as well as opportunities to explore Emily Carr’s state of the art facilities.